French company Two Notes is best known for its highly sophisticated Torpedo cabinet simulator unit and speaker simulator plugin software. Their latest effort is the compact and affordable Captor – a unit that eschews digital modelling and LCD screens for a simpler analogue approach to getting your amp’s signal into a mixer or DAW without using microphones. Around the back of the small metal box, there’s an amp input plus speaker thru and attenuated -20dB outputs. On the front panel, an XLR out carries the single onboard cabinet simulation at line level and combines with an out level control and a three-way switch that optimises the tone for guitar or bass – or you can switch off the speaker simulation altogether. A balanced non-speaker simulated jack output also provides raw amp tones and audio pros will appreciate ground lift and phase switches. Impedance is fixed, but the Captor is available in 4-, 8- and 16-ohm versions. The Captor will run off phantom power but an external centre-negative nine- to 24-volt DC supply can also be used. 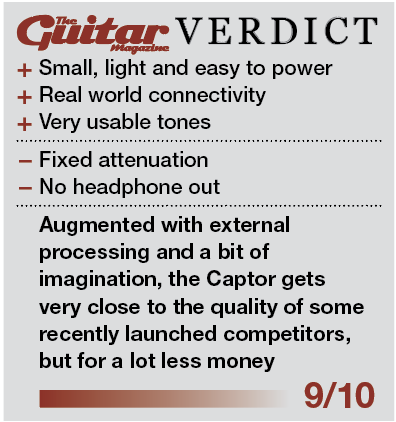 Used purely as an attenuator, the Captor’s fixed 20dB cut provides a substantial amount of attenuation. While it may tame a 100-watt high- gain amp to a sensible gigging level, a 15-watter is reduced to home practice levels. Since the thru output is exactly what it claims, you can plug the Captor’s non-attenuated output into an external attenuator. We find the Captor’s attenuated tone a little bright and fizzy anyway, so nothing is sacrificed sonically to enjoy a finer degree of control. While the Captor restricts you to just one speaker simulation, this may not be an issue because it sounds very good. To our ears, it’s based on a fairly bright, closed-back cabinet/speaker set-up, with tightly controlled bass and a dry, punchy tone that rock players will certainly enjoy. The bass setting warms and smooths to tone, and we actually prefer it with single coils. If your DAW/interface allows you add EQ, compression, delay and reverb effects to the monitor/recording signal path, it gets even more fun. But if that’s not to your taste, Two Notes provides two workarounds. The first is the Torpedo CAB stompbox (£359 street) that contains 32 cabinet simulations with optional software control. The second is a free downloadable plug-in called Torpedo Wall Of Sound. Torpedo Wall Of Sound is compatible with Mac or PC and is compatible with any DAW that will run plugins in AU, VST, RTAS and AAX format. The free download comes loaded with two virtual cabinets, eight microphones and eight power-amp simulations, but entering a unit-specific code that comes with the Captor gives you access to 16 cabinets. There are also various rooms and you can alter ‘mic position’, add effects and EQ the sound while the Captor works as a load box to silence your amp. If the 16 virtual cabinets aren’t enough then more than 150 others are available – you can purchase a permanent license for any extras you want for €8 each. Combined with the Torpedo Wall Of Sound, the overall theme is very similar to UA’s OX, but the processing is done by your computer rather than the Captor. In standalone form it may lack versatility but the Captor does a lot of things really well, it’s solidly made and when integrated with a DAW, it opens up a world of quality direct recording possibilities.